Update on my beet fetish: still going strong. 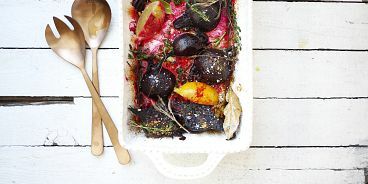 Today’s creation is garlicky, steam-roasted beets (organic beauties from SPUD) with preserved lemon and lots of herbs. They are seriously easy to make – but still look somewhat fancy, no? Feel free to sub in your favourite herb for the saje and the thyme. Anything will work. And if you’re wondering about the copper serving spoons, they’re from The Cross. 2. In a medium casserole dish (I used a 11″x6″ Palermo from The Cross) place your beets cut side down. 3. Drizzle beets with olive oil, then add water, garlic, preserved lemon, herbs and salt & pepper to the pan. Cover tightly with tin foil. 4. Bake for 60 minutes, or until beets are soft. Enjoy solo, chilled on a salad or on rice. The possibilities are endless!